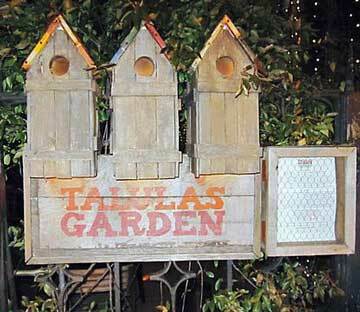 Talulah’s Garden on Washington Square is a bijou of a botanical culinary respite, a verdant outdoor garden of gastronomical enjoyment. But this is wintertime, and as many “swallows” as you wish to envision, summer is not near. The dead of winter forces you inside. Enter without hesitation. Spotlighted highest on the forward two-story wall near the ceiling is the semi-phrase “life and beauty….” Quite a diadem for a meal’s predestination. Wooden blonde tables and white leather banquettes surround the persimmon interior of the massive dining areas, festooned with gold-patterned drapes. Chair-covers mimic the drapes’ motif. Dark thickly wooded ceilings and room-frames abound. Huge, magnificent chandeliers hang about and around in vainglorious demeanor. Chefs have appeared and disappeared under the resplendent lighting as frequently as moths hounded by mothballs. Owners Aimee Olexy in partnership with Steven Starr have modernized the former Washington Square restaurant and introduced young, imaginative chefs to their environs. Matt Moon and Mike Santoro are now gone, to be replaced recently by executive chef Sean McPaul, a garrulous proponent of precision and herbal harmonies. You will neither smell nor encounter hardly any guns of garlic and/or butter under his command. Instead, he creates wondrous mouth-watering repasts with well-meaning holistic-intensive ingredients including (but not limited in any way to) charred fennel, cardamom, truffles, mustard greens, kale pesto, orange zest, chervil, mint and a plethora of purées. Nearby farms deliver the goods. There is, of course, Aimee Olexy’s persisting passion for supernumerary cheeses, at a specially provisioned “bar” reserved for them. Waitpersons have become professors of interpellations and explanations with regard to every curiosity-arousing curd. 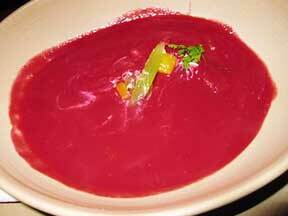 Just for the color alone, you cannot disregard the “Beginning” Warm Beet Soup ($10). The heated broth is ruby red, effervescent in a shallow white bowl. The liquid covers a concoction melded of smoked sunburst trout, celery crisps, horseradish and fruity pears. The celery and pears appear to surface to grasp and gasp for breath, and seem to swirl in the tidal horseradish waves. Your tongue travels from Moscow to St. Petersburg within seconds as you fish with it, garnering the smokiness of the Volga’s trout. Brawny bitter-sweetness pervades every soupspoon’s richness. These beets make you groan as boisterously as a Bolshevik at a party-commune. Nor should you avoid (due to price) the Nantucket Bay Scallops ($16) as a “Beginning.” Gorgeous nuggets of Nantucket’s nourishments are paraded amongst “Pasta alla Chitarra,” parsley, saffron and fennel-scented broth. 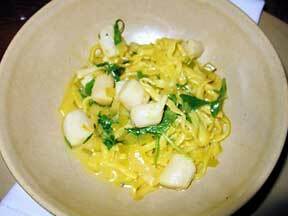 The scallops glisten like pearls relaxing on a thick golden mattress of linguini; reminding you of your own liquidity. Hearty and thick with saffron, if you lift the bowlful to your ear, you can hear the ocean splashing below the Sankaty Lighthouse in ‘Sconset. Brilliantly bouncy on your palate, and succumbing to the languishing linguini’s lather, you melt as the scallops disappear down your throat. 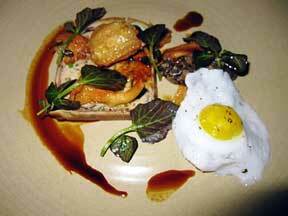 Most of the “Mains” are less adventurous, but just as detailed with spices in design. 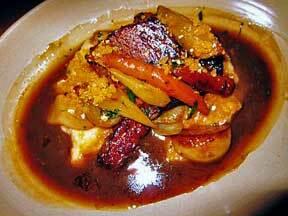 The “Wine Braised Beef Brisket” ($29), for instance, is mahogany darkened from baking overnight, collateralized by mounds of whipped turnips, glazed large carrots and salsify (oyster-flavored roots). The meal is drowning in “jus” that is described as “Autumn Spiced.” The turnips are faintly buttery (an exception to the rule here), and when scooped into the Autumnal sauce with the salsify, your eyes gleam as flavors of land and sea entwine. Carrots then contumaciously gratify. The meat itself is as tender as a judge’s tush after a three-hour closing argument. This is not a brisket you need to worry about “cutting across the grain.” It fairly squeals when prodded by your knife, and spreads open with a juicy welcome. 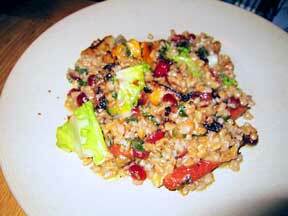 Farro Risotto ($26) is sordidly succulent, each riso engorged with bits of velvetized roasted acorn and honeycup squash, small flags of wilted escarole, baked salted walnuts and kale pesto in a black-olive-caramel vinaigrette. One needs hardly to say more, except to advise that “scrumptious” is too weak a word for a dollop’s definition. Please note that wine is served with a caress from a jorum decanter into your wine glass, a stroke of extra elegance, displayed by a wait staff of eagerly helpful, unobtrusive and clearly dedicated young men and women. 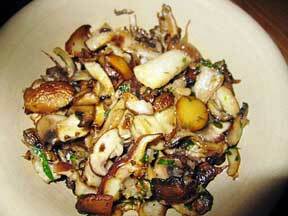 Please order cheeses for dessert, and surprise yourself with a simultaneous side dish of Roasted Mushrooms Galore ($8). You will not fault me.